Early Saturday morning, June 2nd, saw a dedicated group of NCCSAH members and guests gather for an outstanding tour of ecclesiastical stained glass at five locations in San Francisco. Ian Berke’s enthusiastic interest in American stained glass was the inspiration for this tour. At each stop Ian gave an interesting narrative that explained the various types of glass and the glassmaking processes, and helped the audience to recognize the various types and styles of the art. With Ward Hill, he provided historical information on each church. 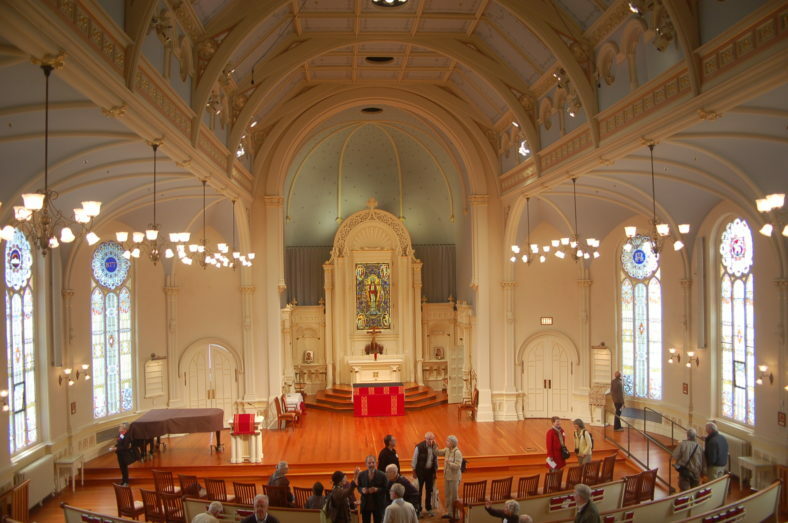 William Kostura offered insights on the history of St. Mark’s and Calvary Presbyterian, and Prof. Paul Turner spoke on the history First Unitarian Church. The tour included a bag lunch stop at Alta Plaza Park, and at the close of the day Maggie and Ian Berke graciously hosted a reception at their Pacific Heights home, whose American decorative arts collection merits a tour all its own. Thank you to the following people who helped to make this tour possible: Susie Moore and Rev. John Anderson at St Johns Presbyterian, Alan Nicholson at Trinity Episcopal, Carol Fox and Joe Beyer at Calvary Presbyterian, Kerry Parker at First Unitarian, and Amy Mallor and Rabbi Larry Raphael at Sherith Israel. A mini-bus from Peninsula Tour, ably driven by Ronald, provided transportation among several of the sites.